Last week we had a very meaningful and moving Remembrance Sunday service. Thanks are due to Harvey for playing the Last Post, and to Peter and Father Ian for our Remembrance reading. 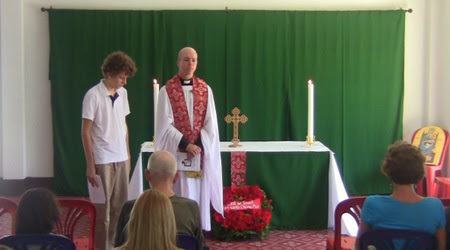 Father Ian was able to take our wreath and lay it, on behalf of the church, at the war memorial in the Foreign Cemetery as part of yesterday’s Remembrance Day observances. 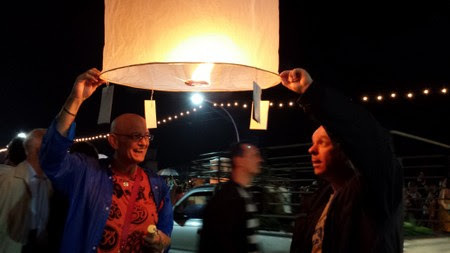 The previous Sunday we celebrated All Saints Day, and last Thursday Elena and I took the cards which we had signed in the service with the names of loved ones, and launched them into the air and on to the water as part of the Loi Kratong celebrations. Meanwhile, Christmas will soon be upon us. The City Life Garden Fair is only a week on Saturday, on the 22nd November, and we will be celebrating the First Sunday of Advent on 30th November. We are also planning a Carols by Candlelight service for 5pm on Sunday 21st December. This will be a traditional service of Nine Lessons and Carols. Please see Harvey if you would like to be involved.